The ten crows are black and white, representing the duality of all things. The crows are each connected to the DNA that is the foundation of all life on this planet. The crows are building the DNA chains. Each chain is gray which signifies all the unknown parts of DNA that we do not understand. The colored balls on the chain represent the building blocks of DNA, which, in human beings, consist of three billion base pairs with each pair made of certain opposites. This is why, in the painting, red is always connected to green and blue is always connected to orange. This is how DNA replicates itself. If you split the chain, the open ends of both sections will attract their opposites and two identical new chains will be formed. Around the crows is a constant swirl of physical and non-physical energy that is the nature of the universe. From this swirling chaos the crows are creating order in the form of life that will further manipulate the chaos within the Infinite Potential. 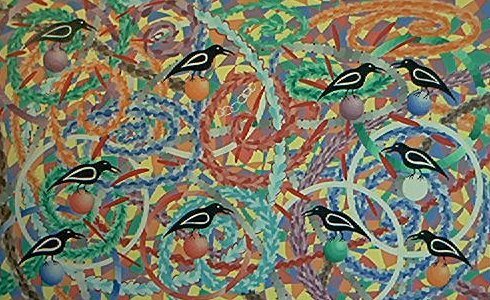 The swirling background within which the crows exist represents the infinite dynamics of the Infinite Potential. Out of chaos comes order and out of order comes chaos. The oneness of the duality of all things constantly manifests and constantly disintegrates all manifestations. This is the nature of the Infinite Potential, which has no beginning and will therefore have no end. This is the great mystery. This is the all-encompassing oneness of which we are all a part.